This year's Craft Brewers Conference and World Beer Cup occurred simultaneously this year in Chicago a couple of weeks back. 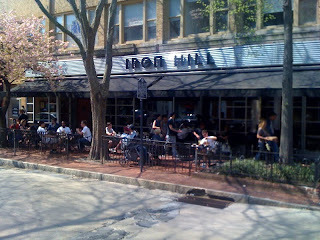 I hadn't yet been back here to properly congratulate and recognize Iron Hill for their outstanding accomplishments. Along the way, Chris LaPierre put up a handful of fun pictures and highlights over at his Maple Shade-based blog. Over in North Wales, Vince Desrosiers had some to say about the doings as well. And, Larry Horwitz down in West Chester, had a little less, but a few words nonetheless, to say about their big trip to the Windy City. Meanwhile, back at the ranch, Jack Curtin weighed in with some conjecture about next moves for the successful brewing company. You didn't click any of those links, did you? Against my better judgment, I'll spell it out for you if you didn't already know and you didn't bother to click any of those links above: Iron Hill was awarded the 2010 Large Brewpub/Brewmaster at this year's World Beer Cup. And, now...I have a dinner to add to the story as well. 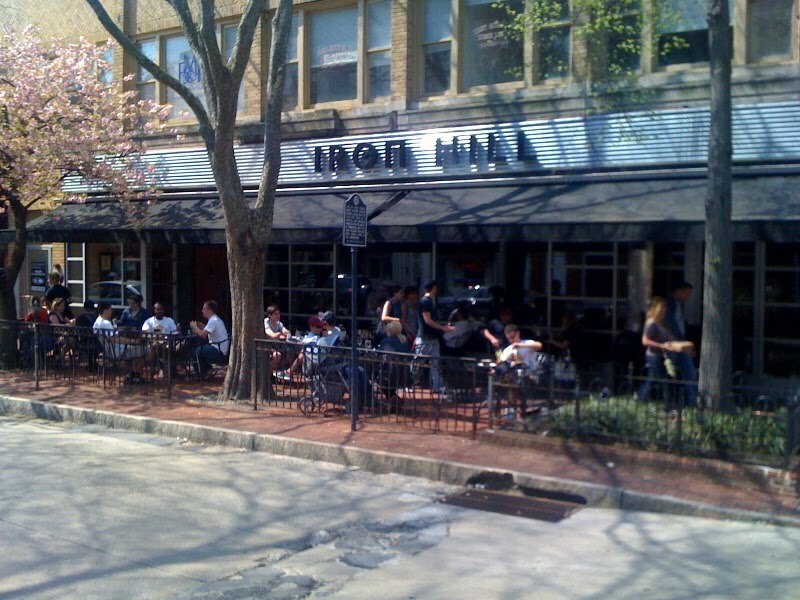 For many months (or, probably more correctly stated....years), I've put off an invitation to join the Iron Hill crew at one of their dinners that they host on an almost monthly basis at one or more of their--now 8--brewpubs. On paper, the dinners always look like winners; the pairings, thoughtfully planned out. Why I've never made it to one before? Hard to say, exactly. They always came highly recommended by those who have. Nonetheless, here I was finally at West Chester with Larry, Jean, and a few other brewers from McKenzie Brew House and Victory, as well as about 15-20 other patrons, some of them regulars who have come to expect a grand slam at these type of prix-fixe dinners. The dinner was comfortably setup in the back room where a long table for 20-25 people was set. After a bit of kibitzing over some of the Saison that I'd raved about just a week earlier to start the evening we all settled down for a brief introduction by head brewer Larry Horwitz. He welcomed everyone and quickly turned it over to his brewing partner-in-crime Jean Broillet. I could go on about the impressive path that we've witnessed Jean take from his early days as a cellarman at Weyerbacher, but I think if you don't already know of his brewing talent, you'll hear bits and pieces of it come out as I rave about this dinner that he and Anthony Young in the kitchen collaborated on. The dinner courses were spaced out nicely enough that we had a couple of quicker-paced servings (well, not that quick...you get the point, I trust) followed by enough time between other courses to mingle around and stretch the legs a bit. The nice thing about dinners in the back room is the extra space both for interlopers as well as room for us diners to move around more freely than at some more, shall we say cramped, beer dinners that I've attended. Not that Iron Hill wouldn't have appreciated having the back bar open for the regular Friday night crowd (though, I have no idea where the financial breakeven point would have been), we all appreciated the extra space for a comfortable dinner. Comfort continued to be the theme as we got into the dinner. No course was overwhelming in portion size and when added together, the sum of the parts did not leave us feeling overfed by the end of the three hour dinner. Nor thirsty from the generous amount of beer being poured. I'm already a few days behind in getting this out to you, so without taking the time to regurgitate (should that word even be allowed in a dinner review?!) the entire menu and each pairing, here were some of the highlights. Wood-aged beer- every beer on the menu spent some time in wood barrels from Chaddsford Winery, which is just down the road a piece (does anyone say that anymore?!). The barrels that they use are a combination of Hungarian, Western Pennsylvanian, and French Oak. This program of wood-fermenting and wood-aging beers began around ten months ago and continues today in the brewhouse in the twelve stacked barrels that they currently have (if you peer in, you can see them from the streetside window). Mix and Matching- Max Pfeffer from Victory reminded me of one of my own Beer Dinner Guidelines: "Always save a few small swallows of each beer for later courses. Don't trust that the dinner planners know your palate better than you do. What more fun is there than finding a pairing that pleases you better than the one that they initially planned on the menu for you?" Unfortunately, he'd reminded me of this after I'd gone and swigged my D'Armand. Du Armand- speaking of....This was my third (I think?) run-in with what I'm still calling one of the top 10 new beers in my book of 2010. In a nutshell, it's a 5.5% Belgian beer that incorporates a strain of Brettanomyces unique to former Belgian brewer, Armand Debelder, of Drie Fonteinen. You say More Ferments equals More Alcohol? !- The Cherry Dubbel underwent two fermentations before being subjected to a third fermentation while in a pinot noir barrel for nine months. Birthed from that barrel was a beer that was put in a keg for the dinner with a little extra sugar, whereupon it underwent a fourth fermentation. Or not, but I think I scribbled all of those notes correctly. What resulted was a very finely made beer that masked its 10.5% ABV so very well. Almost too well, if you know what I mean. Cheese- put cheese on a plate next to a glass of beer and you've got my attention. A cheese plate is something that I believe more beer dinners should end with. Iron Hill put a generous piece of French Bleu d'Auvergne and a slab of Devon Cheddar from England on a plate with almonds and honey. Wash this all down with a Belgian Tripel named Au Ciel and I challenge you to find a better way to end a beer dinner. I can't leave off here without asking the critics of Iron Hill: Is this what you think of when you say that Iron Hill is not "interesting enough for you?"